The iconic Rolex Datejust is one of the longest produced models in the Rolex catalog. Spanning over seven decades from 1945 to the present, the Datejust has evolved into an impressive collection of mens dress watches. While there are many feature sets to choose from, each Datejust has the waterproof Oyster case, automatic movement, and jump date in common. The most recent update to the Rolex Datejust line was in 2009 with the introduction of the 6-digit Datejust II reference 116334. When Rolex developed this newer reference, they upgraded the case to a larger 41mm measurement, creating a dress watch that could compete with modern watch trends. Avid Rolex collectors couldn’t wait to get their hands on the impressive new Datejust II. 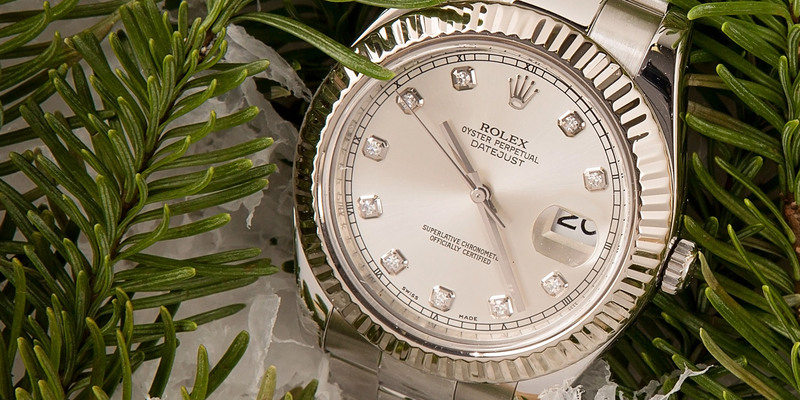 The Datejust II ref 116334 is a stunning watch made with diamonds. 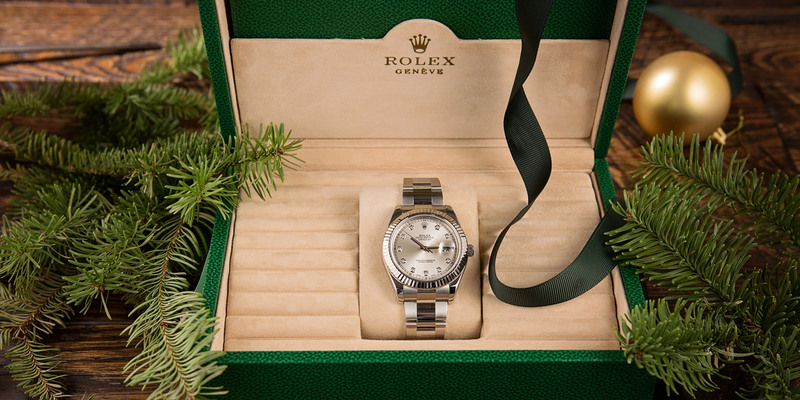 Today, the Rolex Datejust II enjoys just as much success as the day it came to market. Collectors appreciate the case’s ability to offer bold style without weighing down the wrist. The 41mm case also allows for a broader dial and a larger, more legible reading. As a modern reference, the dial on the Datejust II is available in a plethora of colors, hour markers, and handsets. The bezel is also available in either a smooth or fluted finish and is developed by Rolex to slide under the cuff of a long sleeve shirt with ease. Another feature that accompanies every Datejust II watch is the magnifying Cyclops lens which sits over the date display, enlarging it 2.5x. Interestingly, Rolex never offered the Datejust II watches with a dressier five-link Jubilee bracelet, only with a three-link Oyster bracelet. Remember, the Jubilee bracelet made its debut on the inaugural Datejust model in 1945. Again, exclusively using the Oyster bracelet enhances the sportiness of the watch. While the contemporary design of the Datejust ref. 116334 is what attracts many collectors; it’s the Datejust II’s incredible durability that creates its loyal following. The sapphire crystal protects the dial from dings and scratches. The case is also equipped with a Twinlock screw-down crown, allowing it to get wet up to 100 meters. A process of screwing the case back, bezel, and crown into the Monobloc middle case hermetically seals the case, ensuring a lifetime of waterproofness. The Datejust II ref 116334 is a dress watch and can be worn to any party. Rolex aficionados may be familiar with the calibre 3135 movement that often powers most modern Datejust timepieces. With a larger case, however, came an upgraded 3136 perpetual movement developed just for the Datejust II. One of Rolex’s most accurate movements yet, the calibre 3136 boasts a Paramagnetic blue Parachrom hairspring as well as Paraflex shock absorbers. An officially certified chronometer, you can rest assured that your Datejust II is always accurate. With over 70 years in production, there is a seemingly endless list of Datejust variations, each boasting a unique style. But if it’s a powerful and contemporary watch that you seek, the Datejust II 41mm mens dress watch may be the perfect choice for you. Although Rolex recently discontinued the Datejust II collection to make way for the new 2016 Datejust 41 lineup, the Datejust II is still a popular option in the secondary market. By far the sportiest option among all Datejust models, the Datejust II is an ideal daily Rolex for the modern man who appreciates classic design reinterpreted to suit contemporary style.